Starred Review from Atlanta Magazine! (For ages eight to twelve) Inspired by London’s Ye Olde Cheshire Cheese, a sixteenth-century inn with a rich literary history, authors Carmen Agra Deedy and Randall Wright concocted this howler of a tale about a well-educated mouse named Pip and his feline, cheese-loving ally, Skilley: “He was the best of toms. He was the worst of toms.” Adults and children alike will find something to love about this playful romp, featuring cameos by Charles Dickens, William Makepeace Thackeray, and Queen Victoria—all beautifully illustrated by Barry Moser. Deedy, a native of Cuba who grew up in Decatur, is a national treasure and a world-class storyteller. She’ll read from her new book at Decatur’s Little Shop of Stories (littleshopofstories.com) on October 1. View the entire article, written by Thomas Mullen, here. Take a Look Into Carmen’s Workspace! Have you ever wondered where authors sit and write their books? Yes? Then take a few minutes to stop by Jennifer Bertman’s blog From the Mixed-Up Files to learn a little bit more about how and where Carmen writes. While you’re there, be sure to take a look at her other “Creative Spaces” interviews to learn about more of your favorite authors. The Cheshire Cheese Cat Blog Tour! A Word’s Worth – Take a look at some exclusive interior images from the book! Maestra Amanda’s Bookshelf — Wondering what all the fuss is about? Then don’t miss this great review! Through the Looking Glass — There’s a very special letter from one of the main characters over here all about the importance of words (can you guess who it’s from?)! 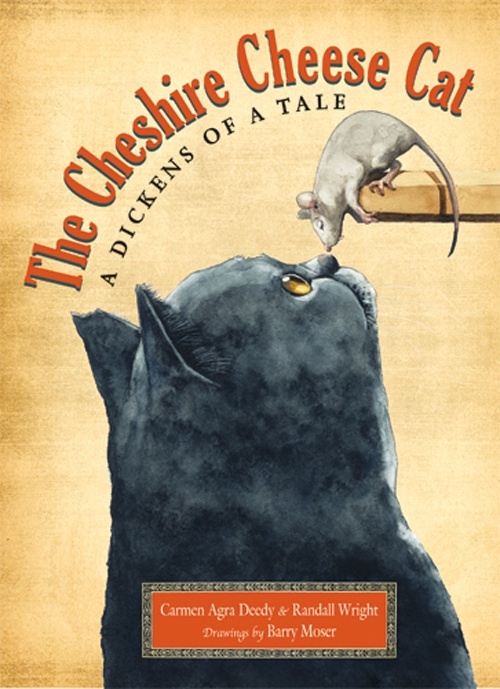 There’s a Book — Check out this great review of The Cheshire Cheese Cat. Satisfaction for Insatiable Readers reviews The Cheshire Cheese Cat and gives you a chance (a couple chances, actually!) to win a copy! Chapter Book of the Day — Ever wonder what it’s like to edit “the next big thing”? Head over to Booktalking’s Chapter Book of the Day to read an interview with Margaret Quinlin, editor of The Cheshire Cheese Cat! Not Just for Kids – Check out some exclusive interior images and read a great review of the book, plus another chance for you to win a copy of the book! YA Books Central is featuring an excerpt from The Cheshire Cheese Cat! Maestra Amanda posted her ideal cast of voices for the characters of The Cheshire Cheese Cat! What fun!